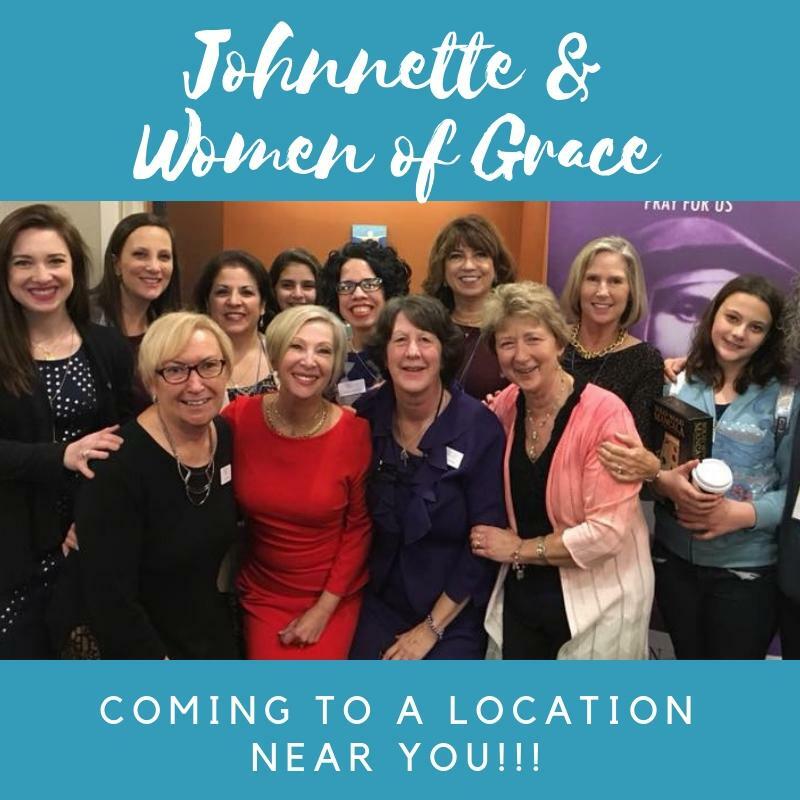 Johnnette & Women of Grace Coming to a Location Near You! Check out some of our upcoming speaking engagements and events! We'd love to meet you!!! The Young Women of Grace “Dare to Prepare” retreat is a day of Advent reflection for teen girls ages 12+ that includes Mass, social time, games, and a very special Christmas craft/gift. Susan Brinkmann, OCDS, co-author of Young Women of Grace: Embrace Your Femininity, will give two presentations: “Say Hello to Emmanuel – the God With You” which teaches girls how to practice the presence of God in their everyday lives, and; “The ‘Yes’ That Changed the World” which explains Mary’s role in the Redemption and the critical role women play in the world today through the gift of their unique feminine genius. A local youth minister will also address the girls on the importance of respecting themselves in the way they dress and relate to themselves and others. This day includes a light breakfast, pizza for lunch, and lots of homemade Christmas cookies & treats! the gift you are to the world! in the Church at this time. a healing service, and individual ministry by prayer teams. Based on the great mystical classic, The Interior Castle , written by St. Teresa of Avila, Live Like a Catholic is an 8-week course taught by Susan Brinkmann, OCDS, that details the soul’s journey through the seven mansions – or stages – of the spiritual life, which work in tandem with the soul’s growth in prayer. 7. What it means to become truly poor in spirit. Each week participants have a homework assignment. Instruction will include a once-a-week online class lasting one hour. It will consist of an opening prayer, review and discussion of the homework assignment, a 20 minute lecture, and 15 minutes for Q&A. Online sessions for this 8-week course will take place throughout the 2019 Lenten Season on Tuesday evenings at 8:00 PM EST, beginning on March 5th and ending on April 23rd. Study materials will be emailed a week prior to each meeting. ***Though Live Like a Catholic is the sequel to Pray Like a Catholic , it is not necessary for participants to have taken Pray Like a Catholic in order to benefit from this course. June 20-21, 2019: SAVE THE DATE!
" Women: God's Special Weapon Against Evil"
June 21-23, 2019: SAVE THE DATE! July 11-12, 2019: SAVE THE DATE! August 1-2, 2019: SAVE THE DATE! August 1-4, 2019: SAVE THE DATE!